Spanning over 60 miles, the Eagle River has plenty of sections to explore. 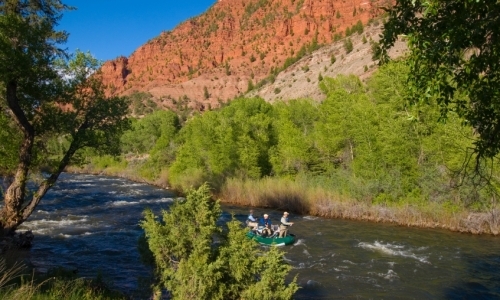 The Eagle River is one of the last undammed rivers in the state of Colorado so it is truly a natural environment. While that often causes water levels to fluctuate throughout the season and can produce unreliable whitewater, when the Eagle is flowing there are some great rapids to be found. Two of the most commonly rafted sections of whitewater on the Eagle are the Lower Eagle and Dowd Chutes. While on the same river, these two sections are very different and offer great whitewater opportunities for all levels. The Lower Eagle is full of splashy class II rapids, with some class III rapids, making it a great trip for people of all ages! With small holes and rollercoaster rapids, you and your fellow paddlers will have a splashy good time. As you meander down the valley you will be witness to some of the most pristine high alpine and desert scenery. If looking for a more intense experience, the Dowd Chute on the Eagle River is an adrenaline junkies first choice of whitewater. The Dowd Chute has some of the best early season whitewater in the state! Though only a quarter mile long the Dowd Chute rapids are non-stop. With continuous rapids and a narrow chute at the end, which you blast through, there is plenty of excitement to be had. The Eagle River is a dynamic river with varying levels of whitewater for all ages. Whether you are looking for splashy fun for the whole family, or a thrilling experience in continuous rapids, the Eagle River has whitewater for all.